Stems: Erect, usually unbranched below, glabrous, containing sticky, brownish latex. Leaves: Alternate, simple to pinnately lobed, sessile or clasping, ovate to obovate, 8 to 12 inches long, 2 to 4 inches wide; midribs on underside of blades sometimes bristly; margins conspicuously spiny-toothed. Inflorescences: Panicles, open, cone-shaped; heads terminal, 50-100 heads; bracts lance-shaped, about 1/2 inch long. 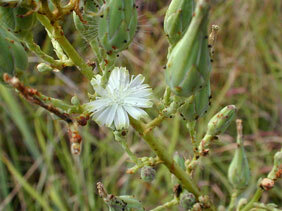 Flowers: Ray florets 20-30, light blue, pale yellow, or bluish with yellow tips; disk florets absent. Fruits: Achenes, flat, dark brown, enclosing small seed; beaks thread-like, tipped with numerous white bristles. Habitat: Open prairies and disturbed areas, most abundant on limestone soils. Comments: The flowers are open for only a brief time in the morning.